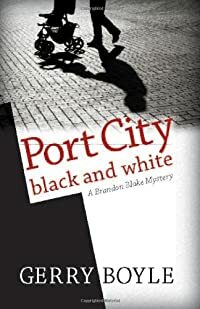 Port City Black and White by Gerry Boyle: Synopsis and Online Purchase Options. Synopsis (from the publisher): Brandon Blake, the tough and resourceful kid from the Portland waterfront, has made it: he's been hired by the Portland Police Department. But the newest rookie on the night shift isn't pulling any punches. And when a drug-addled mom can't find her baby, Blake — whose mother left him and was killed when he was a toddler — comes down on her hard. Except the baby really is gone. Meanwhile, Blake's girlfriend, aspiring writer Mia, sees Brandon drifting into the world of cops and crime and leaving her behind. Brandon's relentless search for the child brings a load of trouble down on him, threatens his career, his life, his relationship. Will he end up alone on his old cabin cruiser Bay Witch? Or worse?